What is the right hairstyle for your face shape? Is your face more Diamond, Heart, Oval, Long, Round or Square shaped? What is the shape of your face and what are the hairstyles that will suit you best? The shape of your face and facial features can be both complimented and opposed by cut and style of your hair. for example, a large forehead can be muted with a sweeping fringe and high cheekbones can be emphasised with soft waves bent at the temple. It is important to consider the features of your face that you like and discuss with your stylist the best way to highlight them before committing to any big change with your hair. Take a look at our guide to defining your face shape and the styles to consider and avoid. 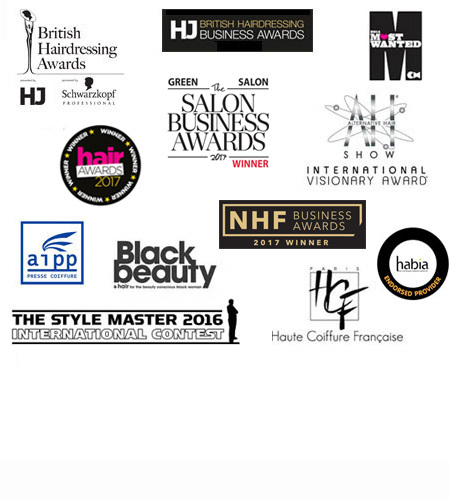 Discuss with your stylist during your consultation – for styling appointments why not book on line here? Styles such as loose curls that are full at your temples and chin with the hair close to your head in the cheekbone area will work best with your features. The hair looks best in a slightly off-center parting with a side sweeping fringe. Medium length styles compliment your face shape and those with symmetrical lines will balance out the narrower proportions of the face. The very short styles and a center parting as this will add fullness at your cheeks and imbalance your facial features. Also avoid hair cut in at the temples and too much volume at the top of the head as this will draw attention to the cheeks and create a top heavy look. A heart shape face has a narrow jaw and is wider at the forehead and/or cheekbones. The only difference between the heart and inverted triangle face shape is that a heart shape face has a widow’s peak. Choppy layers, super short hair and volume at the crown. Pulling your hair back off your forehead. Styles that are full at the temples. Too much height on top of your head. An oval face has a length that is equal to one and a half times the width. You will have a narrow and softly pointed chin and your forehead is wider than the chin. Your cheekbones are a dominant feature and the face tapers gracefully from cheekbone to chin. Widely considered to be the most balanced and beautiful face shape, you can choose almost any hairstyle and length. Your main considerations are the styles that will suit the texture, curl and quantity of your hair as your features are already balanced. If you are over 40 its best to keep the length on or above shoulder length and to choose styles that sweep hair away from the face. a blunt cut if your hair is curly or thick. An oblong face shape is longer than it is wide (imagine the proportions of a rectangle). Long and narrow, this face shape generally has a high forehead, straight cheekbones and a long, narrow bone structure. A hairstyle that is short to medium in length will most compliment a long face. You can soften the face shape with soft layers that fall around your face. Any hair cut that is below the chin is best for this face shape. Styles that create width work wonders, such as chin length bobs, brow skimming fringes and curls or waves. The style should add width at your temples and cheekbones. A little volume (not too much) at the top of your head is also good to create different dimensions. If you have a high forehead,a fringe is a good way of breaking up the wide expanse of face. Keep your hair either straight and wispy or swept off to the side and not too thick. Keep the sides off your face, either swept back or short & long hair should add width at the neckline. Long straight flat hair as this will only make face even longer as will super short hairstyles. Highly stylised styles such as angular cuts, extremely short styles, severely slicked down. Volume only on top of your head. Hair close to the sides of your face. A round face is as wide as it is long with soft, round edges. Your cheeks and jaw are the same width. The lines of the face are curved with the width at the cheek below the cheekbones and your hairline is wide and round. Go for styles that add height to the top of the head with your hair off the face, but close to the head. A centre or long diagonal parting and layers will compliment your face shape and create dimensions. Styles that end just below the chin, or with layers ending below the chin look best. Hair styled in gentle waves with whispy ends will give your hair texture.Side swept bangs are also a good look for those of you with round faces. curly short hair, short, cropped styles, styles that add volume at the sides. Wide forehead and square jaw line. Both forehead and jaw line are wide and square. Cheekbones and jaw are the same width. Hairline is usually straight across. The goal with a square face shape is to play down your angular jaw line. This is easily accomplished with texture such as curls or choppy ends. Short to medium length is the best but if you like longer hair then go for layers that start at the jaw and work their way down. Layered bobs with wisps around the face, and long layers are generally recommended for this face shape – styles that add height to the top of the head. A good tip when styling is to curve and angle hair across the forehead. An off-center parting with soft, layered styles, whisps, curls and waves will compliment your face. Hair close to your ears will also emphasise good, angular cheekbones. Of course we can. Call us on 01865 727077 (Oxford) or 01869 248495 (Bicester). Best thing would be to pop in for a chat or book a 30 minute consultation which is £20 but we refund it if you go ahead with ANY service. I’m sure we can advise you about a style perfect for you! I live in Ireland. I have fine hair but have loads of hair. It is straight. I have a small forehead but I have an angular chin. I would love if you could recommend a hairstyle for me.